Are you forced to start every morning with hot tea and honey because your throat is so dry and scratchy that it hurts to swallow? Naturally, you blame it on the spicy food you ate the night before. Perhaps the air in your home is too dry or your seasonal allergies are getting to you, even though you haven’t sneezed once. There are a lot of things you could blame it on, but have you considered that snoring is the culprit? Maybe you are single, so you haven’t had anyone tell you that you are snoring. Well, that sore throat you are battling could be a symptom. Is Mouth Breathing to Blame? Sinus infection, nasal polyps, swelling of the turbinate, and a deviated septum are common causes of mouth-breathing. Of course, you don’t need to have a condition to breathe through your mouth. Some people do it naturally. Tissue vibration is significantly greater when air passes through the mouth than when it flows through the nose. During nasal breathing, the soft palate moves forward so the airway becomes opened. When you swallow, the soft palate moves back to block the nasal passages. This soft palate is simply muscular tissue that extends from the roof of your mouth. The uvula, another small extension, is at the back of your soft palate. The palate and uvula are commonly the culprits behind snoring. They relax into the throat when you sleep, and create an obstruction. If you are breathing through your mouth, air is constantly trying to push past both of these extensions. They vibrate against one another, and also against throat tissues. This causes swelling and irritation, so you wake up with a sore throat. Not to mention, the friction dries your throat. While you are sleeping, you are not constantly swallowing to provide mucus membranes with moisture. It is no surprise your throat hurts, especially if your house is dry, too. Addressing the dry air in your house will help, but you also need to do something about your snoring to get real relief. 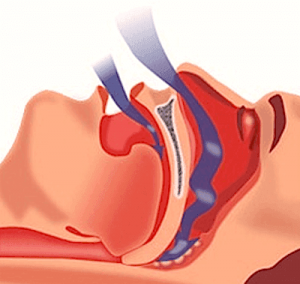 Anti snoring devices may be the answer. These devices promote proper airflow by eliminating the obstruction. If tissues are not permitted to vibrate they won’t irritate your throat.